Whelp, it's 2010 now, and as usual, I'm filling up my schedule to the point I will have zero free time until what looks to be a little before 2014. If the world is even still around at that point. Despite not having much free time, I've still managed to work in some knitting (I'm going through one of my knitting phases, so all my crocheting has been put on the back burner temporarily. It's for the Harry Potter House Cup, which I spoke about in my last entry, for the Divinations class. We're allowed to make mittens, gloves, anything to cover the palm, and I decided to knit my first pair of mittens. I've crocheted some in the past, so knitting them was a whole new adventure to me. I had also never made a horseshoe cable before, though I'm not sure that's a huge feat if you know how to make cables already. 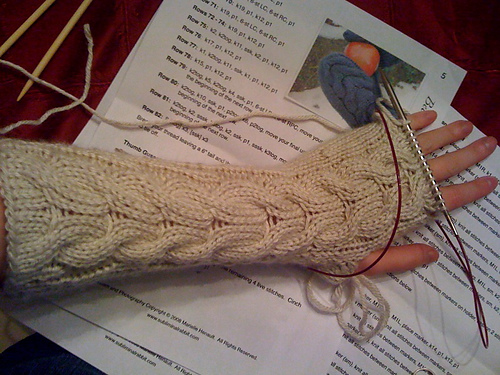 But the biggest thing I've learned so far is the magic loop method of knitting in the round. I've always stood by my DPN's, but let's face it - that was only because I was too lazy to learn any other method. I absolutely love magic loop now. I have absolutely no annoying ladders in my work, I don't stick myself with sharp, tiny needles, and it's much easier to try on your work as you go because of the ease the longer cable gives you. I'm about halfway done with the second mitten, which has worked up really quickly for me. I switched over to making cables with DPN's instead of those idiot cable needles, which might be why I'm moving faster and my stitches are loose enough to slide around from needle to needle. I hate cable needles - ARGH! The pattern is really simple and easy to follow. One other thing is that I'm using the incorrect yarn weight on these, so the gloves are bit tighter and stretchier, but that's not a bad thing. I figured that would happen going into it, and I like more fitted gloves because my wrists are so small. I knew whatever I'd make would fit, due to the 1x1 rib, so I just sort of jumped in. They look super tiny, though, when I'm not wearing them. I can't wait to have these done! And I'd definitely love to make more. Kudos to the HPKCHC for forcing me to go out of my comfort zone, try new things, and possibly even finish a project for once. Newer PostATTN: B&N - Where are your knitting/crochet calendars?! Older PostHappy New Year - Have a Giant Cupcake!